Just by being a woman in Cd. Juárez puts you at risk. For years, women have disappeared from the city and hundreds have been found murdered in the desert. Many of Juárez's poor population works in a maquiladora (sweat-shops and factories), an industry booming after the NAFTA agreement in 1994. International companies, mostly US based, chose to produce in Mexico because of its cheaper labour for maximum profits. Workers are hired for $5 a day, 12 hours' shift, with no rights and no protection, and can be swapped or fired without prior notice or reason. The treatment of the workers helps create a society where people are perceived as disposable. Many of the murdered women disappeared on their way to work or on their way home, due to last minute changes in their working schedule, leaving them without protection from friends or family members. One can only speculate on the involvement of some corrupt employers, just like the police officers investigating the very crime committed. The NI EN MORE studio acts in opposition to the maquiladora’s mass production standards. We will produce unique garments in a safe environment. With total transparency we share our stories from our studio and the local community, reducing the distance between the consumer and maker, exemplifying the direct benefits of ethical and fair trade. 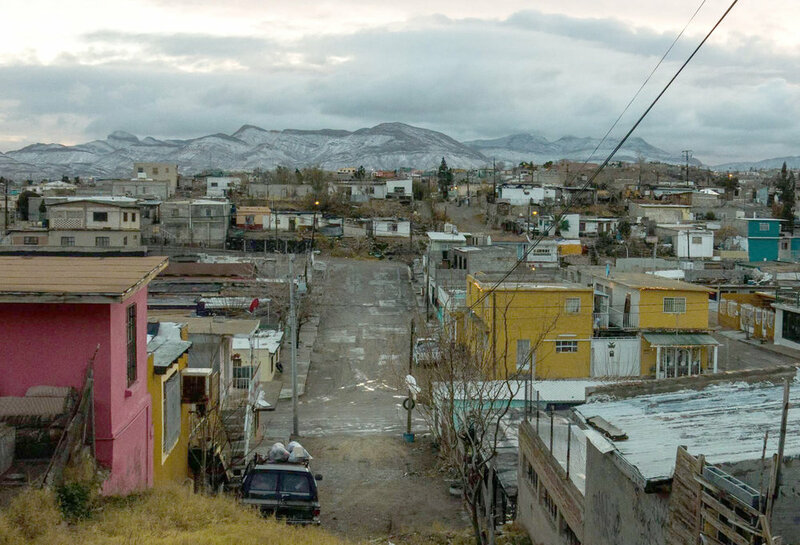 Cd Juárez, located on the border to the US, is a city of contrast: vibrant, yet violent and unsafe. In addition to its more than 300 sweatshops the largest imports of illegal drugs to the USA pass through Cd. Juárez. The violence is met by many socio-political activist initiatives creating an energy of urgency and protest. Despite the success of recent private and public initiatives, the disappearances and murders have still been increasing the last six years. To learn more, please see ellastienennombre.org or Google map of registered femicides in Mexico or /and CNN's fast fact about the Mexican drug war. The Mexican writer and director Lourdes Portillo's award winning documentary film, "Señorita Extraviada /Missing Young Woman" (2002), shares the brutal history of the Femicides in Cd Juárez. The local women who participate in the NI EN MORE project live in high risk areas in Cd. Juárez. The current conditions favor organized crime and leaving the women vulnerable and without the necessary resources for decent housing or transportation. It is important to emphasize that these women are made vulnerable because of their gender, color and social class. Read more about gender equality at UN WOMEN. Our multidisciplinary team from Mexico, Norway and USA, all have connections to the local community in Cd. Juárez. We have built bonds and trust over time. All of us are bringing in needed skills, a determination to contribute and a common belief that change is possible. Currently, NI EN MORE is in its establishing phase where we are raising funds through crowdfunding and other donations. We have just moved into a new studio space, located in a safe area of Juarez, within the next year we hope to have all our needed equipment in place. In our backyard we would like ot grow our own flowers for our printing process. The studio also has unused "raw" space that we can develop as areas for teaching more women our skills. We plan to be self-sufficient within 3 years. Our first products will be ready for purchase in March 2018 through our coming webshop and Pop-up stores in our collaborator's cities: Oslo (March 2018), NYC (April 2018), Mexico City, El Paso and Houston. Details will be posted as soon as they are ready. 1. Create a sustainable business model in Cd. Juárez for production of clothes, combining craft, needlework, international design and art to produce unique, one of a kind garments. 2. The line of clothes will spread awareness of empowerment of women, just production and simultaneously connect communities locally and internationally in the fight against violence towards women. 4. Maintain a fresh approach and develop new ideas and techniques for its design. We see involving new and young designers in the projects future creations as an interesting model for growth.